Extinction is sometimes more confusing than it looks. It is easy to tell when some species become extinct — a Martha or a Lonesome George dies and there are no more, not now, not ever (until science fiction kicks in.) But for species that didn’t meet their end in captivity, that were always rare, that lived in remote areas, had retiring habits, or bore confusing similarities to their relatives, or simply lacked publicity — well, we can say we haven’t seen them in x number of years. We can say we’ve looked so hard. We can calculate how much viable habitat is left, we can extrapolate lifespans and population densities. We can draw matters out according to our own inclinations of hope or despair. 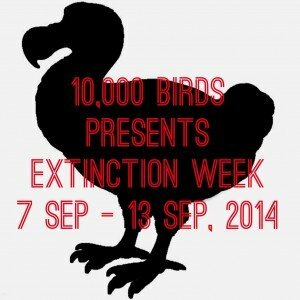 But when it comes to the moment of extinction, often we cannot know. Such is the case with the Pink-headed Duck, Rhodonessa caryophyllacea, a native of India, Bangladesh, and Myanmar. Is it extinct? Is it not? The debate has raged since the 1950s. The hopes of the hopeful center on the remote riverine swamps of Myanmar, a nation which has not exactly been a hotspot for tourists who want to knock about with binoculars in recent decades. 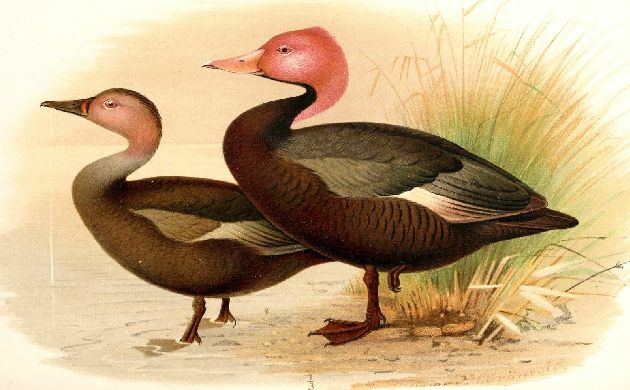 The doubts of the doubtful point out that the species is easy to confuse with more common species like the Red-crested Pochard and Spot-billed Duck, and that no actual specimen has been obtained since 1935. More recent sightings, including a photograph taken in 2009 (and which the photographer himself admits may well be a White-Winged Duck), have been embraced in the main by the cryptozoological world, where there is a strong streak of “I want to believe!” that leads to comments like “…my wife and I observed what I could swear is that exact bird two days ago, on a pond in NE Wisconsin!” In fairness I should note that a Birdlife International team — who presumably know a merganser when they see one — did spot what they were “99% sure” was a Pink-headed Duck during a bird survey in 2004, and BLI itself treats the species as Critically Endangered rather than Extinct, full stop. So not utterly hopeless, either. And what a pink bird the world would get back if the cryptos were indeed correct in this case! For this duck was (is?) not “pink-headed” in the sense that a Ring-necked Duck is ring-necked or a Red-bellied Woodpecker is red-bellied. No, this is a bird that, in the male breeding plumage, shows off a robust pinkness of head that is all the more vivid in contrast with the bird’s dark body. It is long-necked, too, and has an adorable little party-hat crest. The male in Henrik Grönvold’s 1907 illustration for the Journal of the Bombay Natural History Society, reproduced here, is even wearing what appears to be a satisfied grin. When it comes to a bird like that, I want to believe too. Maybe we can get one of those monster-hunter tv shows to send you after it?